Micro-hydropower technologies—systems that harness the energy in flowing water to produce between 5 and 100 kilowatts of electricity—have proven to be a particularly attractive kind of “little development device” in Nepal. While Nepal is a country with abundant water resources, the same fractal topography that provides Himalayan “hydraulic head” also limits the reach and feasibility of large-scale energy infrastructures. In recent decades, as plans for large-scale hydropower projects requiring big dams have waxed and waned, micro-hydropower projects that function at the community scale have provided electricity to hundreds of thousands of people living beyond the national grid. More than 3,000 micro-hydropower projects capable of generating an estimated 48 megawatts have been built to date, constituting roughly 5 percent of Nepal’s total electricity generation (AEPC 2016). Considered against a backdrop of protracted political volatility and recursive patterns of developmental promise and failure, the proliferation of micro-hydropower in Nepal emerges as a tentative success story. A recent report by the UN Conference on Trade and Development (2017), for example, suggests that 81.7 percent of Nepal’s rural population now has reliable access to electricity. On April 25, 2015, the 7.8-magnitude earthquake that struck Nepal prompted new questions about the relationship between energy security, environmental risk, and community resilience. Amid the diverse futures and risks carried by different forms of hydropower development in Nepal, micro-hydro technologies have helped facilitate the work of post-disaster recuperation and repair. 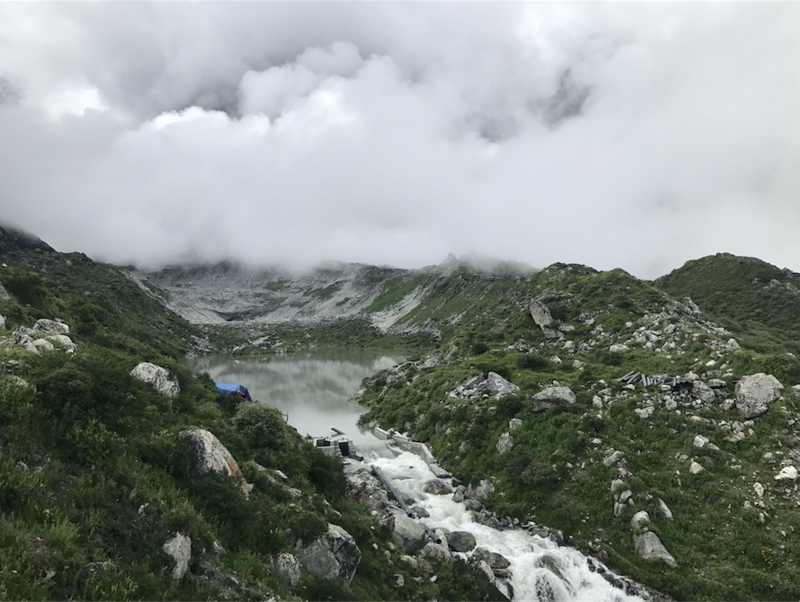 In the Langtang Valley, the contrast between local efforts to construct a community-scale micro-hydropower project and plans for the much larger, 400-megawatt, Langtang Storage Project are examples of this. For the Langtang community, which was devastated by a massive co-seismic avalanche during the earthquake, the micro-hydropower project has emerged as a technology of hopeful post-disaster recovery and an investment in local autonomy. For planners, policymakers, and developers in Kathmandu, the separate large-scale storage project (designed to create a strategically important high-altitude reservoir that could help generate dry-season power and potentially supply drinking water to Kathmandu) is an important step in their ongoing project of “making a hydropower nation” (Lord 2014; Lord 2016). The contrast between these two differently imagined energy futures speaks to the scalar politics of energy security and the ways that Nepal’s hydropower frontier (half real, half imagined) is shaped by diverse economies of anticipation (Cross 2015). In Nepal, micro-hydropower typically is framed as a technology for the liminal meantime: a temporary fix that eventually will become redundant with the arrival of an infrastructural future perfect. Nepalis living in communities away from the grid commonly reference micro-hydropower as a technology for coping with disconnection, abjection, uncertainty, and absence. As Cross (2016) also has pointed out, “Off the grid, grids do not disappear into the background but become the object of heightened attention. In places that are not connected to the electricity grid, and have little prospect of future connection, large scale electricity infrastructures can become more rather than less prominent” (194). As one woman in the Lamjung district told me in 2014, for example: “Ma marepacchi matrai pradikhaaranko bijuli aauncha (Only after I am dead will electricity from the [Nepal Electricity] Authority come).” For Nepalis who identify themselves as members of a neglected infrastructural public (cf. Collier et al. 2016), micro-hydropower technologies offer a means of securing not only energy but also dignity, agency, and relative autonomy. Yet in the wake of a disaster like the 2015 earthquake, the question of “what kind of hydropower development and for whom” re-emerges. In places like Nepal’s Langtang Valley, ongoing debates about “the damage done and the dams to come” in seismically active hydroscapes are particularly pertinent (Rest et al. 2015; cf. Butler and Rest 2017; Lord, in press). Though all infrastructures are contingent—tentatively situated in “demanding environments” (Carse 2014) and inclusive of their own potential ruination (Howe et al. 2016)—it is increasingly obvious that, in the Himalaya and elsewhere, some infrastructures are more precarious than others. When the earthquake struck Nepal, I was standing in a part of the Langtang Valley that would be flooded by the lower dam of the proposed Langtang Storage Project—a 400-megawatt, two-stage reservoir project that is imaginatively rendered in a map of “Rasuwa Tomorrow” (see fig. 2). Just a moment prior, I had been discussing the prospect of this project with a Langtangpa hotelier named Dindu. Figure 2. 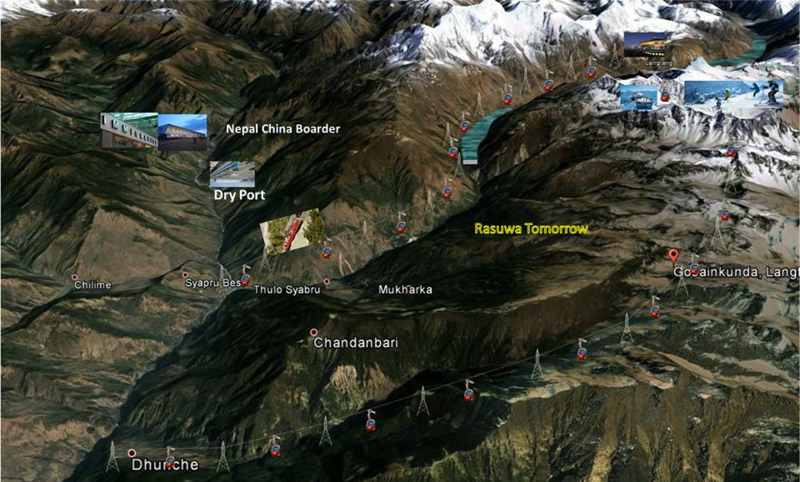 “Rasuwa Tomorrow,” an image created in 2014 by the Chilime Hydropower Company depicting an imagined infrastructural future in the northern region of Nepal’s Rasuwa District. 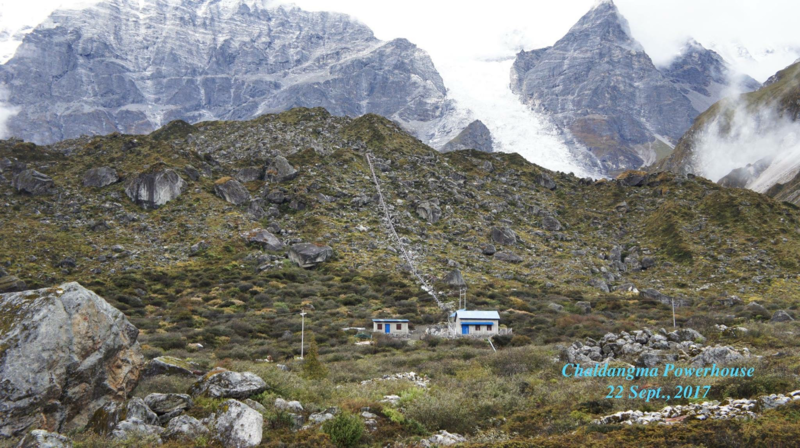 In the upper-right quadrant of the frame, between images of gondolas and skiers, one can see the double reservoirs of the proposed Langtang Storage Project above and below Langtang village. Like many other potentially “project-affected people” living across Nepal’s hydropower frontier, Dindu viewed the coming of a large hydropower project as a kind of opportunity—an infrastructural undertaking that would bring roads, a greater flow of tourists, and increased political connectivity. As a well-educated man, he also knew that the project would include a budget for “corporate social responsibility” that could be used to fund community development projects in the affected area. He also was aware of recent industry trends focused on “sharing the benefits” of hydropower development that already had turned several hundred thousand Nepalis into “local investors”—by selling them an equity stake in hydropower companies on the Nepal Stock Exchange (Lord 2016; Lord, in press). As one of more than 30,000 satisfied local shareholders of the Chilime Hydropower Company, which had constructed a 22-megawatt project downstream more than a decade earlier, he was interested in future opportunities for investment. Standing outside his kitchen, Dindu and I spoke of the potential social and environmental impacts of the project, but not of seismic risk. Suddenly, the earth heaved beneath us and a series of landslides broke loose from the steep valley walls above. Dindu grabbed my hand and we ran for open ground, struggling to keep our feet as the earth shook for a whole minute. We felt a wave of cold air, and it started to rain heavily as debris poured down around us. Confusion reigned. When the air cleared, we could see that a massive mixed-debris avalanche had buried the ancestral village of Langtang (see fig. 3), just a few kilometers upslope from us, taking the lives of more than 300 people. The scale of devastation and loss was incomprehensible. Figure 3. 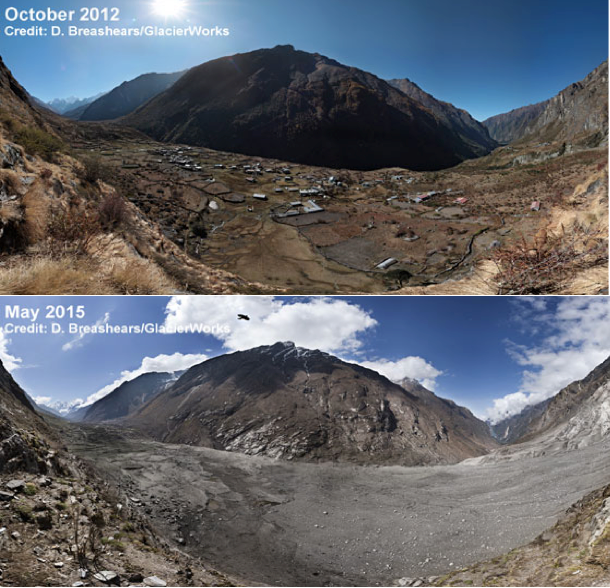 Langtang village, before and after the avalanche (David Breashears/Glacierworks). The earthquake caused significant loss of life, widespread destruction of property, and debilitating damage to a variety of critical infrastructures across Nepal. According to the official Post-Disaster Needs Assessment conducted in June 2015, seventeen grid-connected hydropower projects representing roughly 15 percent of national generation capacity were “severely damaged,” and damage to transmission and distribution infrastructures left some 600,000 households without electricity (Government of Nepal 2015). The event also troubled the making of Nepal’s promised energy future, as dozens of hydropower projects still under construction were damaged—in some of these areas, locals say that landslide occurrence was intensified by the blasting of project tunnels. In short, the event exposed a variety of threats to large-scale infrastructures. Figure 4. 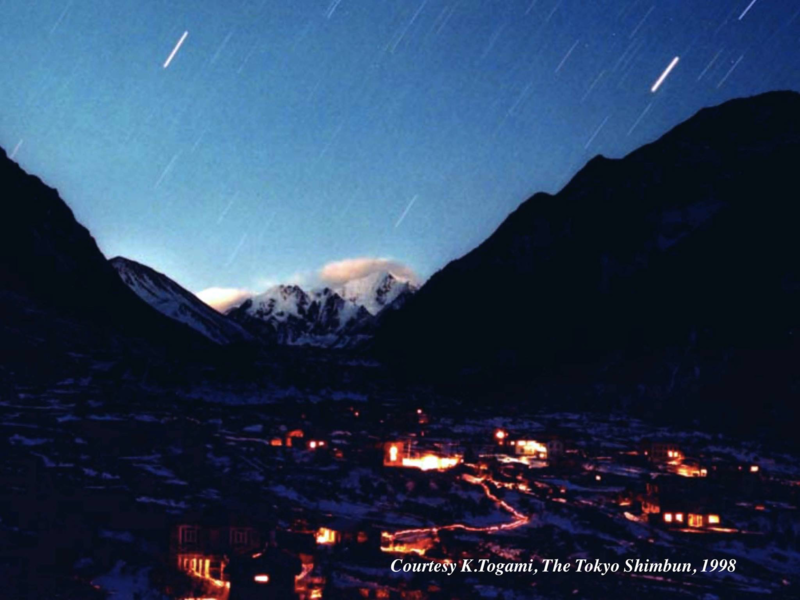 A photograph of the lights of Langtang village, taken shortly after the installation of the first micro-hydropower project in 1998 (K. Togami, The Tokyo Shimbun). Walking through the avalanche zone a few months after the earthquake, I encountered the remains of the Langtang community micro-hydropower project. Built in 1998 with support from a Japanese NGO, the project was presented as both an investment in community infrastructure and a technology of environmental governance—one of several initiatives designed to help the Langtangpas sustainably accommodate rising tourism in Langtang National Park, which was created around the community in 1976. As tourism and local demand for electricity continued to increase, the project was upgraded to 11 kilowatts—indexing both an improvement in the material conditions of life in the valley and changes in the ways the Langtangpa were “imagining the good life” (Lim 2008). When the avalanche came, it took the micro-hydropower project, and everything else. But, critically, the destruction of this project did not amplify the effects of the disaster or expand vulnerability/exposure. Figure 5. The remains of the Langtang micro-hydropower project (Austin Lord). Since the vast majority of the dams planned across Nepal had not yet been constructed when the earthquake hit, there were no dam failures. However, if the proposed Langtang Storage Project had been built prior to the earthquake, then the avalanche—a mass of 3 billion kilograms that fell more than 3,000 meters from the slopes of Langtang Lirung (7,234m) and covering a kilometer of the Langtang river in debris while releasing half the force of the Hiroshima atomic bomb (Kargel et al. 2016)—could have caused a dam failure, and perhaps thousands more deaths downstream. How to think the unthinkable? In the aftermath of the disaster, the entire Langtang community was displaced to Kathmandu, where they lived in a camp for internally displaced persons for several months. As the aftermath dragged on, the people of Langtang slowly returned to begin the long and painful process of rebuilding their lives—despite the extreme level of damage, a remarkable lack of support from the Government of Nepal, and the logistical challenges of rebuilding in such a remote location. Though the earthquake had damaged more than 300 micro-hydropower projects, the majority could be retrofitted or repaired (Government of Nepal 2015). 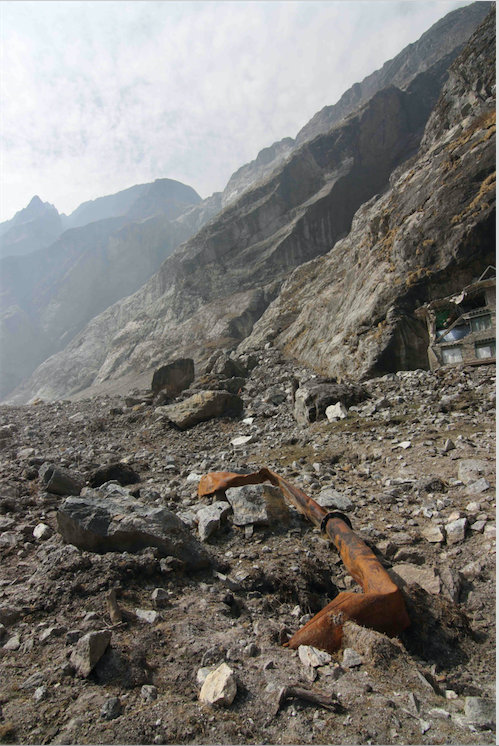 While the Langtang community had repaired the micro-hydropower facility and local transmission systems several times in the past (in response to damage inflicted by storms, rockfall, and smaller avalanches) the exceptional intensity of the 2015 avalanche and questions of safety at the project site prevented them from doing so again. They had to formulate a new energy strategy. For more than two years, the Langtangpa relied on solar units for electricity (mostly donated by humanitarian organizations and volunteers after the disaster, with a few older units salvaged from the hotels). When the Langtang Management & Reconstruction Committee announced plans to construct a new micro-hydropower project in late 2016, it seemed like a hopeful point of inflection in the process of reconstruction and recovery. Figure 6. Project materials being airlifted by helicopter to the project site at Kyangjin Gompa in November 2016 (Nima Lama). Construction on the project, relocated to a new site further up the valley near Kyangjin Gompa, began in early 2017. The project was funded largely by a British NGO called Kadoorie (an organization focused on agricultural development and community infrastructure, now working to support post-disaster recovery) with additional contributions from the Langtang Management & Reconstruction Committee and the Local Development Office of Rasuwa District. 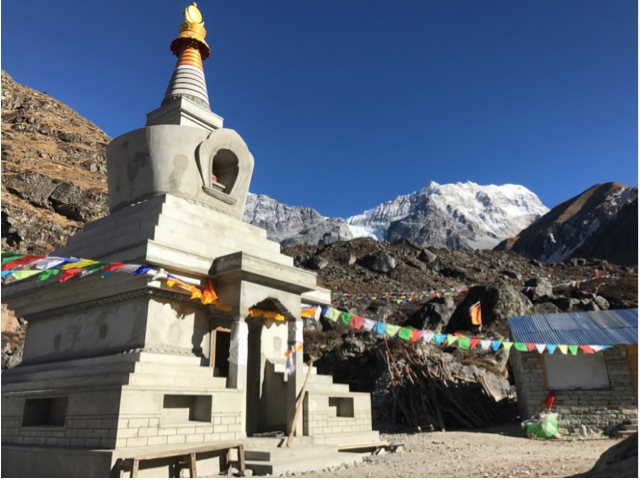 With the permission of the Langtang National Park, the capacity of the new project was scaled up to 100 kilowatts, to provide electricity to 116 households, a variety of communal buildings, and the recently rebuilt monastery at Kyanjin Gompa. The project is also expected to support a handful of local enterprises, such as the famous yak-cheese factory that processes milk from local herders, which will now use far less fuelwood for pasteurization. The local leaders of the Micro-Hydropower Project Committee that was created to manage the construction process often describe the project as an effort to create a secure future. For them and many other Lantangpas, it is important that the project provides more than enough power to meet current needs, that it will be able to accommodate future demand once the Langtang Valley makes a full recovery. In this sense, the micro-hydropower project has been maximized, so as to obviate the need for future upgrades or external support—to sustain Langtang society beyond the reconstruction phase as the shape of its needs continue to change. Figure 7. Transmission towers awaiting powerlines along the trail through the Langtang Valley in July 2017 (Austin Lord). When I visited the Langtang Valley in July 2017, the majority of people were still rebuilding their houses and the path was lined with transmission poles awaiting power lines (see fig. 7). The project site was a tangle of activity, with one team installing the turbine assembly inside the powerhouse and another busy constructing the 230-meter penstock pipe that would be used to channel water from the lake. Electricity meters and spools of wire were stacked up inside the powerhouse. After several weeks spent transporting materials to the site, all was ready. Figure 8. Installation work going inside the project powerhouse in July 2017 (Austin Lord). Later that day, I met with Son Nurpu, the Secretary of the MHP Project Committee, and climbed up to the project intake at Lirung Tal (the glacial lake that supplies the new project, located roughly 150m higher than the powerhouse). Along the way, he explained more about the technicalities of construction process, the trainings that the local technicians had received, the local electricity metering system they would manage, and the work that still remained. 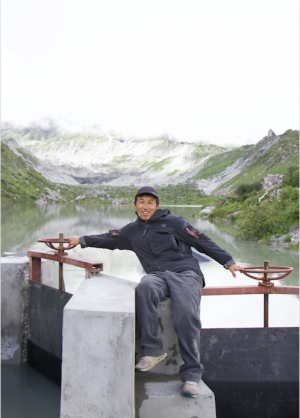 When we reached the lake, Son Nurpu climbed onto the headworks at the outlet of the lake and posed theatrically, smiling with a contagious enthusiasm. After watching the broader Langtang community struggle for more than two years, this was a powerfully affective and hopeful moment. Figure 9. Durga Bahadur, the project site supervisor from Kadoorie, stands next to the incomplete penstock pipeline while explaining the project design in July 2017 (Austin Lord). As an off-grid infrastructure, the micro-hydropower project in Langtang functions in two registers: it facilitates systemic recovery while also creating space for and enabling the more creative and hopeful practices of recuperation. As Guyer (2017) suggests, efforts toward recovery focus on functionality and reconstitution, while practices of recuperation are more improvisational, fragmentary, and open-ended. Figure 10. The project headworks and intake at the outlet of Lirung Tal (4055m), the glacial lake that serves as the natural reservoir for the project (Austin Lord). If micro-hydropower projects like this are successful, perhaps it is because they are adaptable and can be reconfigured to serve diverse communities and needs. In this sense, micro-hydropower is a “fluid technology” (Law and Mol 2001; Redfield 2016), which can be reconfigured to fit the exigencies of a particular landscape and create “fluid space” outside of broader networks, like the grid. Indeed, micro-hydropower has been used for centuries in a variety of cultures and conditions, in the cracks and gaps of other systems, well before it acquired its current status as a “little development device.” The resilient and fluid qualities of micro-hydro that humanitarians now acknowledge are intrinsic to its historical success. Figure 11. MHP Committee Secretary Son Nurpu posing dramatically on the headworks of the micro-hydropower project in July 2017 (Austin Lord). Though the Langtang micro-hydropower project has only just been built, the site-specific and improvisational quality of the design speaks to its fluidity. 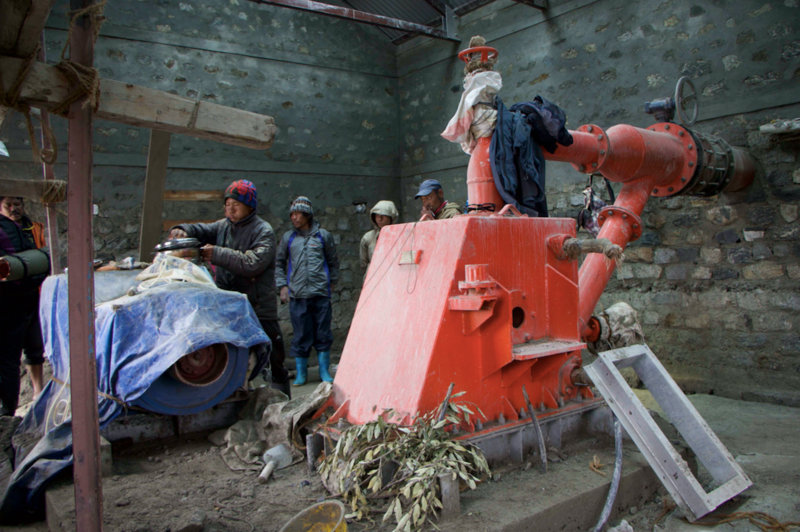 The unique location of this project, which is sited at the outlet of a glacial lake at an elevation of 4055m (reportedly the highest project site in Nepal), speaks to the ways that micro-hydropower systems can be adapted to the particularities of landscapes. For centuries, the people of Langtang have been living with and adapting to geological hazards and climatological exposures: repairing homes, trails, and other local infrastructures as needed in response to landslides, avalanches, earthquakes, and storms. They have developed their own version of what Jackson (2014) conceptualizes as “broken world thinking,” oriented around the repeated practice of “the subtle arts of repair by which rich and robust lives are sustained against the weight of centrifugal odds” (222). As such, the new project was built in an area the locals say is naturally sheltered from future avalanches by a nearby glacial moraine—it was reconfigured and placed in the landscape. Figure 12. 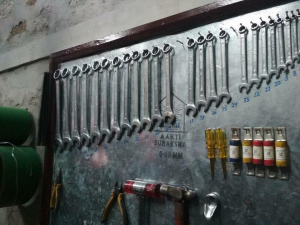 Tools and fuses hanging in the project powerhouse. A locally managed account has been created to fund any necessary maintenance or repairs that might be needed in the future (Seraph Tamang). In response to a suggestion from Sangay, one of the Langtangpa lamas (Tibetan Buddhist monks), the design of the micro-hydropower project also was modified so that the water flowing through the turbines could be diverted to turn a large prayer wheel housed within a recently built Memorial Stupa—a structure dedicated to the memory of those who lost their lives during the earthquake, constructed in part by donations from families around the world who lost loved ones in Langtang. 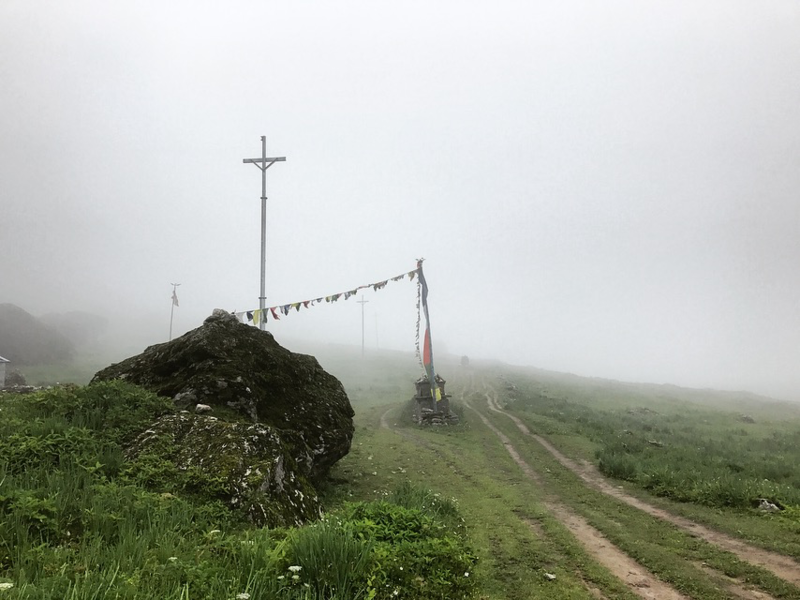 This joining of infrastructure with local practices of prayer and memorialization is particularly important because Langtang is considered a beyul, or a sacred hidden valley meant to serve as a refuge for Tibetan Buddhist practice (Lim 2008). This particular improvisation scales up the traditional practice of building smaller prayer wheels that can be turned by a mountain stream—a design that predates the advent of electricity and is still used throughout the Himalaya. As the water flows through the prayer wheel it is understood to be sending prayers to the heavens in perpetuity, animating the scarred landscape. Figure 13. The Langtang Memorial Stupa, where water diverted for the micro-hydropower project is now flowing beneath this stupa, turning a large prayer wheel inside (Austin Lord). In these ways, the micro-hydropower project has become meaningfully imbricated in localized processes of recuperation and repair in a way that would not have been possible with a larger and pre-configured technology. It was designed to account for both the material agencies of the environment and its own precarity, and reconfigured in ways that enabled the contingencies of local “repair work.” As Jackson (2014) explained, the work of “repair occupies and constitutes an aftermath, growing at the margins, breakpoints, and interstices … it fills in the moment of hope and fear in which bridges from old worlds to new worlds are built, and the continuity of order, value, and meaning gets woven, one tenuous thread at a time” (223). 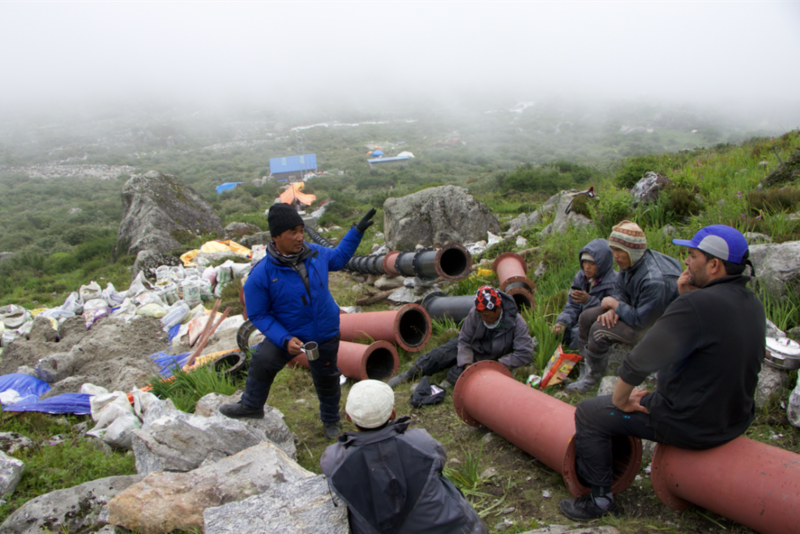 The construction of this new micro-hydropower project in Langtang, a highly situated and highly relational infrastructural technology, reflects the multivalent efforts required to weave a fractured community back together in the wake of disaster. When the earth shook, it created a series of cracks in the future perfect, momentarily interrupting Nepal’s dream of becoming a “hydropower nation” and creating an opportunity to rethink the country’s energy strategy. In the aftermath of the 2015 earthquake, one of Nepal’s most prominent politicians and policymakers co-authored a piece in The New York Times calling for a more diversified energy strategy in Nepal. In no uncertain terms, the piece asked, “Can Nepal rely on its built and planned hydro infrastructure given the inevitable seismic activity in the Himalayas?” (Thapa and Shrestha 2015: 1). Figure 14. A photo of the micro-hydropower project demonstrating its scale and position in the broader landscape, taken shortly before project completion (Ayako Sadakane). Ongoing debates over the inherent risks of hydropower development in the Himalayan region point to a need for “technologies of humility” (Jasanoff 2003) that recognize the limits of knowledge and prediction. As a place where the material agency of the landscape has been made so apparent and so much is uncertain or unknown, the Langtang Valley seems an appropriate place to consider the value of humility. Indeed, with an earthquake even more powerful than that which devastated the Langtang Valley in 2015 now considered overdue in Western Nepal, and massive uncertainties about the impacts of climate change lingering over the Himalaya like a cloud, a degree of infrastructural humility would seem critical. Yet in contrast to the humility of micro-hydropower, the large hydropower projects being planned and built across the Himalaya, which require building immense webs of concrete and tunnels throughout a seismically active zone, seem to materialize a specific kind of infrastructural hubris. In the wake of the earthquake, the Government of Nepal has expended considerable energy to ensure that its hydropower frontier has remained open for business. Official plans for large-scale hydropower infrastructures remain intact, emboldened by the speculative logics of finance capital, geopolitically inflected narrative of energy sovereignty, and the inertia of infrastructural affect focused on a dream deferred (Lord, in press). This failure to reckon the inherent precarity of Nepal’s imagined hydropower future reflects a familiar pattern of infrastructural ambition and oversight (Huber et al. 2017; Butler and Rest 2017). Like large-scale infrastructure projects across the globe, Nepal’s big hydropower projects are imaginative undertakings enacted “through engineering hubris, false environmental assumptions, and short-sighted development policies” that elide their own vulnerabilities (Carse 2017: 905). The continued focus on achieving energy security at the national scale marginalizes alternative accounts of Nepal’s energy futures and perpetuates a “strategic ignorance” (McGoey 2012) of palpable environmental and infrastructural risks. At the time of this writing, the Langtang micro-hydropower project has just been completed, and the lights are on throughout the valley—which this struggling community is incredibly proud of. 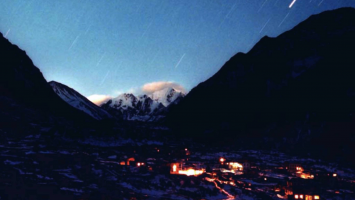 Tellingly, at the same time, the 400-megawatt Langtang Storage Project is moving ahead as planned—with the support of state officials, the Langtang National Park, the private sector, and a segment of the Langtang community. 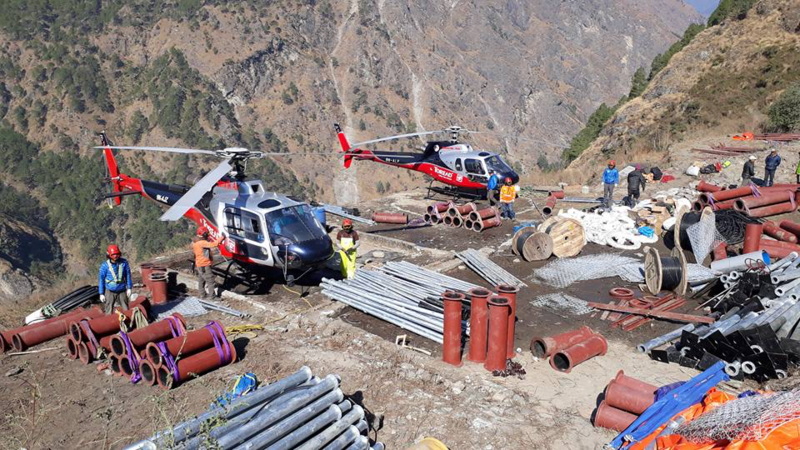 Helicopters are flying into Langtang with surveyors; contracts are being discussed. As post-disaster reconstruction continues, new uncertainties are emerging. Across the Himalayan region and perhaps the world, infrastructures and their infrastructural publics are constantly being made and unmade, prompting a tacking back and forth between hubris and humility. When speaking about the large-scale project and the increased connectivity it might bring, many Langtangpa express a kind of ambivalence, often using a classic Nepali phrasing to highlight the double-edged nature of development, pointing to “bikas sangai binas [development with destruction]”. Some fear the changes the large-scale project could bring; others still dream of “Rasuwa Tomorrow.” When considering the entanglement of these differently imagined futures and the technologies used to enact them, the question recurs: what kind of development or destruction, and for whom? Figure 15. 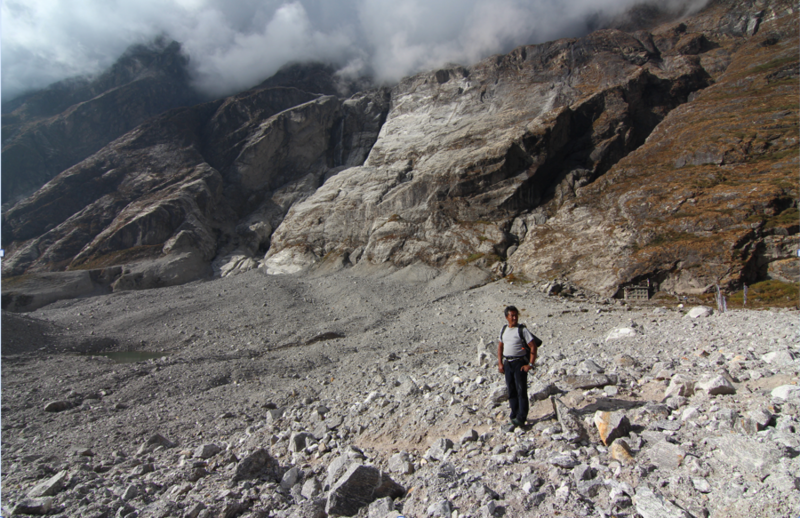 Dindu, the man who I was speaking with about the proposed hydropower project at the time of the earthquake, stands in the blast zone of the Langtang avalanche (Austin Lord). This essay draws on field research supported by Cornell University and a U.S. Foreign Language and Area Studies Fellowship. I would also like to thank Sudan Bhattarai, who assisted greatly with field research in the Langtang Valley, as well as Marina Welker, Ashley Carse, and the Editors of Issue Number Nine who provided valuable feedback on prior drafts. Alternative Energy Promotion Centre, Ministry of Population and Environment, Government of Nepal. 2017. Website & Data. Available at link. Butler, Christopher, and Matthäus Rest. 2017. Calculating Risk, Denying Uncertainty: Seismicity and Hydropower Development in Nepal. HIMALAYA, the Journal of the Association for Nepal and Himalayan Studies, 37(2): 15-25. Carse, Ashley. 2014. Beyond the Big Ditch: Politics, Ecology, and Infrastructure at the Panama Canal. Cambridge: MIT Press. Carse, Ashley. 2017. “An Infrastructural Event: Making Sense of Panama’s Drought.” Water Alternatives, 10(3): 888-909. Collier, Stephen; Chris Mizes; and Antina von Schnitzler. 2016. “Preface: Public Infrastructures / Infrastructural Publics.” Limn, 7(1). Available at link. Cross, Jamie. 2015. 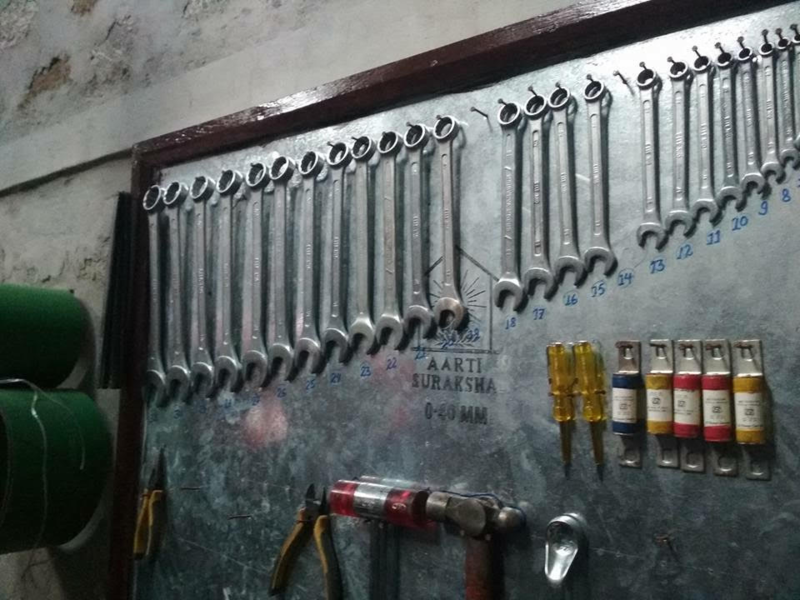 “The Economy of Anticipation: Hope, Infrastructure, and Economic Zones in South India.” Comparative Studies of South Asia, Africa and the Middle East, 35(3): 424-437. Cross, Jamie. 2016. “Off the Grid: Infrastructure and Energy Beyond the Mains.” In Infrastructures and Social Complexity: A Companion. Harvey, Jensen, and Morita eds. Abingdon, UK: Taylor & Francis, 186-196. Government of Nepal, National Planning Commission. 2015. “Post Disaster Needs Assessment, Vol. B: Sector Reports.” Kathmandu: Government of Nepal. Available at link. Guyer, Jane. 2017. “Aftermaths and Recuperations in Anthropology.” Hau: Journal of Ethnographic Theory, 7(1): 81-103. Howe, Cymene et al. 2016. “Paradoxical Infrastructures: Ruins, Retrofit, and Risk.” Science, Technology, & Human Values, 41(3): 547-565. Huber, Amelie; Santiago Gorostiza; Panagiota Kotsila; María J. Beltrán; and Marco Armiero. 2017. “Beyond ‘Socially Constructed’ Disasters: Re-politicizing the Debate on Large Dams through a Political Ecology of Risk.” Capitalism Nature Socialism, 28(3): 48-68. Kargel, J.S. et al. 2016. “Geomorphic and Geologic Controls of Geohazards Induced by Nepal’s 2015 Gorkha Earthquake.” Science, 351(6269). Jackson, Steven. 2014. “Rethinking Repair.” In Media Technologies: Essays on Communication, Materiality, and Society, Gillespie, Boczkowski, and Foot eds. Cambridge, MA: MIT Press, 221-239. Jasanoff, Sheila. 2003. “Technologies of Humility: Citizen Participation in Governing Science.” Minerva, 41(3): 223-244. Law, John, and Annemarie Mol. 2001. “Situating Technoscience: An Inquiry into Spatialities.” Environment and Planning D: Society and Space, 19(5): 609-621. Lim, Francis Khek Gee. 2008. Imagining the Good life: Negotiating Culture and Development in Nepal Himalaya. Leiden: Brill. Lord, Austin. 2014. “Making a ‘Hydropower Nation’: Subjectivity, Mobility, and Work in the Nepalese Hydroscape.” HIMALAYA, the Journal of the Association for Nepal and Himalayan Studies, 34(2): 111-121. Lord, Austin. 2015. Langtang. Hot Spots, Cultural Anthropology website, October 14, 2015. Available at link. Lord, Austin. 2016. “Citizens of a Hydropower Nation: Territory and Agency at the Frontiers of Hydropower Development in Nepal.” Economic Anthropology, 3(1): 145-160. Lord, Austin. In Press (2018). “Speculation and Seismicity: Reconfiguring the Hydropower Future in Post-Earthquake Nepal.” In Water, Technology, and the Nation-State. Menga and Swyngedouw eds. London: Routledge Earthscan. McGoey, Linsey. 2012. “Strategic Unknowns: Towards a Sociology of Ignorance.” Economy and Society, 41(1): 1-16. Redfield, Peter. 2016. “Fluid Technologies: The Bush Pump, the LifeStraw® and Microworlds of Humanitarian Design.” Social Studies of Science, 46(2): 159-183. Rest, Matthäus; Austin Lord; and Christopher Butler. 2015. “The Damage Done and the Dams to Come.” Hot Spots, Cultural Anthropology website. 14 October 2015. Available at link. Thapa, Gagan, and Kashish Das Shrestha. 2015. “Natural Disasters and Nepal’s Energy Security.” The New York Times, DotEarth Blog, May 25, 2015. Available at link. United Nations Conference on Trade and Development (UNCTAD). 2017. “The Least Developed Countries Report 2017: Transformational Energy Access.” Geneva, Switzerland: United Nations. Available at link.